Either you have already received or will receive a copy of the For Small Hands catalog. 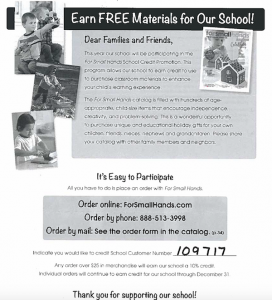 Our school will be participating in the For Small Hands Credit Promotion which allows us to earn credit to purchase classroom materials to enhance your child’s learning experience. All you have to do is place an order with For Small Hands and indicate you would like to credit School Customer Number 109717.